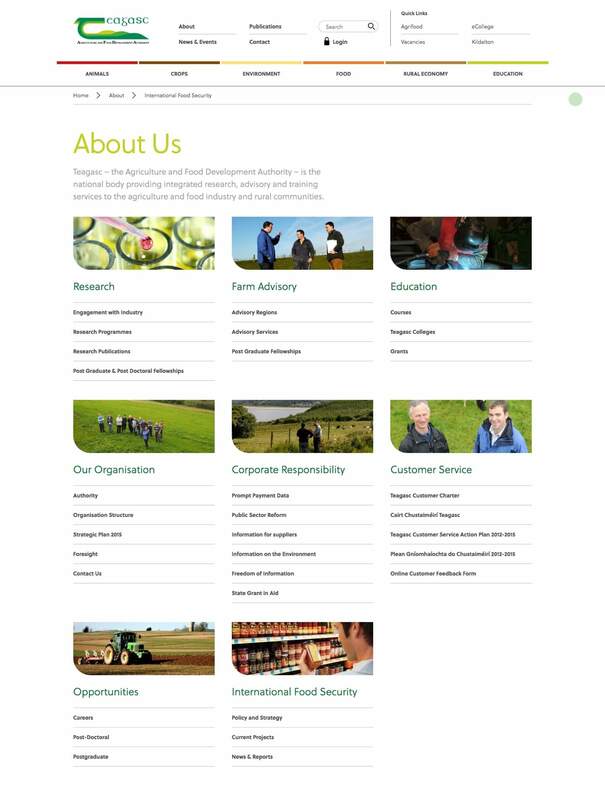 Teagasc, the Agriculture and Food Development Agency of Ireland is a national body providing research, advisory and training services to the agriculture and food industry. This ranges from farm-based apprenticeships to food production research and beyond, acting as a central hub to a range of different members, including students, farmers and other governmental departments. 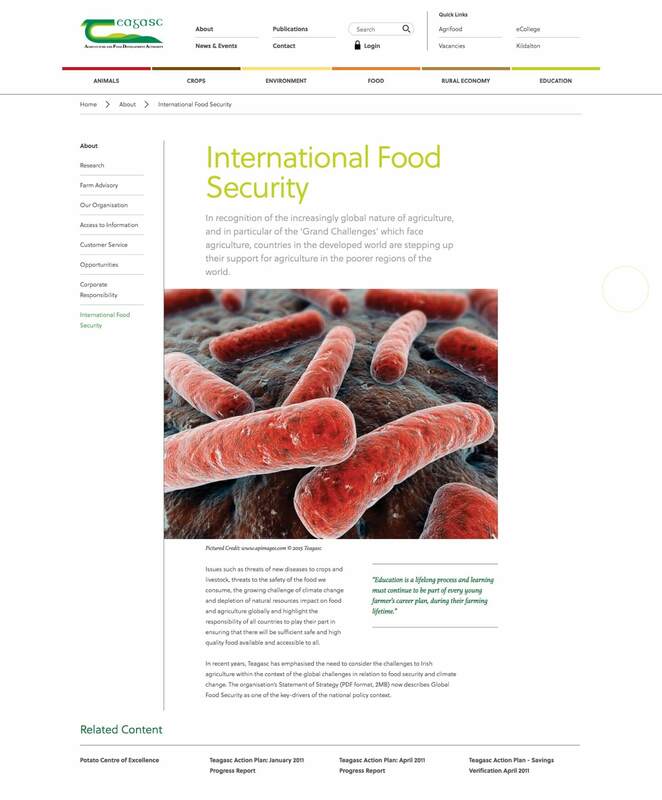 The website they had was based on our technology partners, TERMINALFOUR CMS and whilst looking to upgrade their system to the latest version of the CMS, they asked Roundhouse Digital to help them with a UX which enabled greater interaction with Users and a more on-brand experience which showcased the institution as a leader in agriculture and food development. 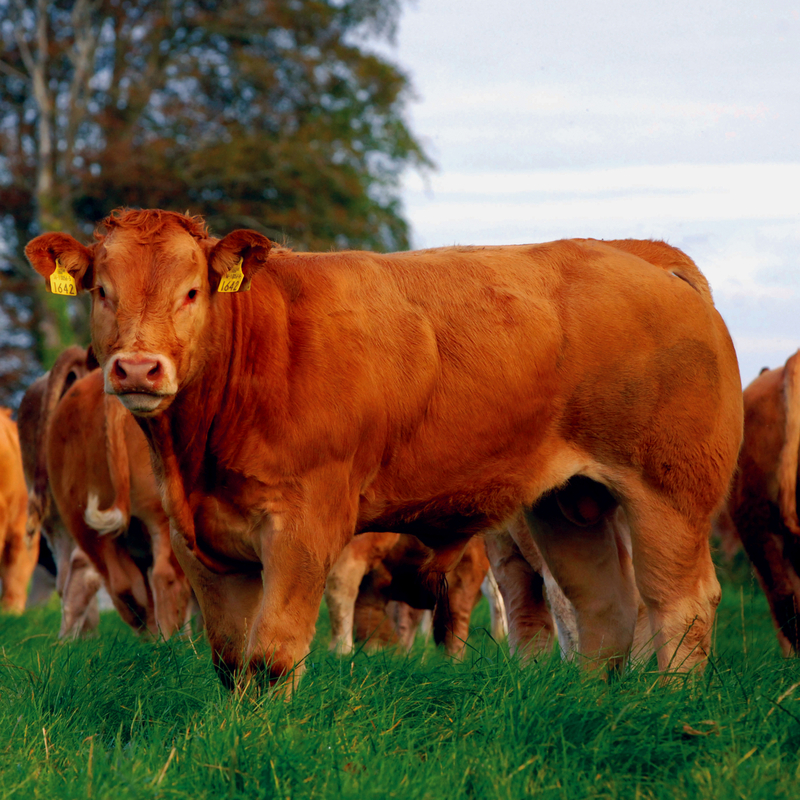 Our approach started with getting a detailed level of understanding of both the audiences which Teagasc were looking to engage with and the content which they had to display. With an understanding of this, we were able to recommend an intuitive information architecture which enabled all Users to easily locate the content they required or, alternatively, access specific personalised content through access to a portal. In addition to this a new visual identity, based on the colourways already in existence, enabled Teagasc to highlight certain content in a colour coded manner, for additional visual recognition, so Users knew which content was most relevant to them. The new visual identity we introduced takes inspiration from the clean minimalist information led design of sites such as .gov and restructures the in-depth content from a department orientation to a user orientation with clearly defined categories of areas of interest such as animals, crops, environmental, food, education and research. The site is highly optimised so page load time is prioritised to serve up long-form content quickly to visitors. Roundhouse Digital included an adaptable login section whereby only restricted content could be accessed which could be utilised should the client wish to activate it. Otherwise the login would announce that all content is free for public viewing. 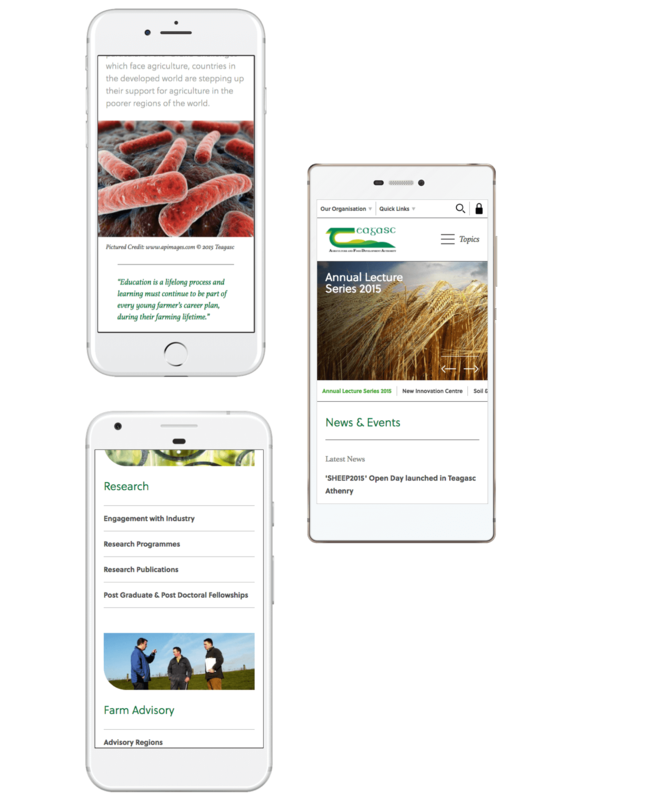 The new website was the first mobile-first web technology that Teagasc ever had, enabling farmers, and those in more-remote locations to access immediate content as and when required. In addition to this, as per the above mentioned optimisation, the site was relatively light meaning that content could still be visible on a small bandwidth or 3G connection. 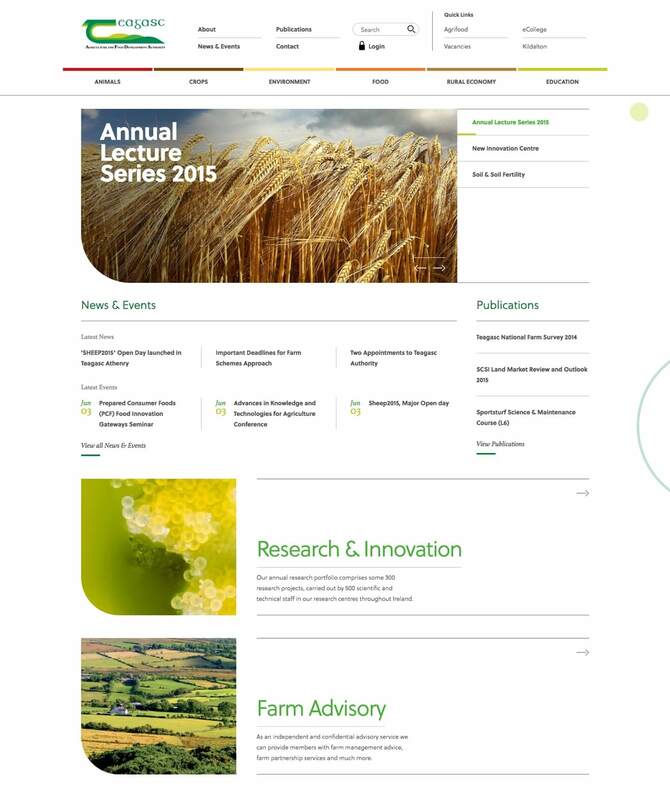 The result of this was a far greater use of the Teagasc website across all platforms. In addition to this the flexibility of the Information Architecture we developed enabled the agency to continually add new and updated content to their website responding to the latest news, research and policy in all relevant fields.